I like to conclude the savory portions of my menus with a light broth to sip on. My first iteration was a sprouted lentil soup. This updated version is my take of a Chinese soup made from daikon radish and pork. 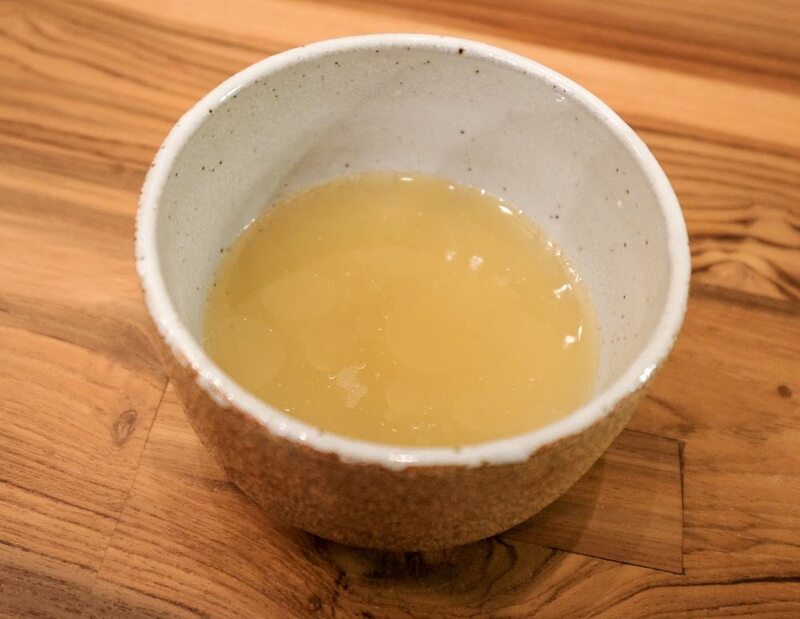 It's served as a consommé, which means its been clarified to remove excess fat and sediment that would cloud the soup - crystal-clear consommé is a labor of love and point of pride for many chefs. The traditional method of clarification involves combining a mixture of egg whites, vegetables, and ground meat and simmering in the soup for up to an hour. During this time, the proteins in the egg white congeal the mixture into a "raft" which collects impurities from the soup, which is then very carefully ladled out through a hole in the center and strained through cheesecloth or similar fine mesh. Like many recipes on fivetwentysix, we're doing away with traditional methods in favor of modern technique (inspired by one from ChefSteps, of course!). Instead of using egg whites for the raft this preparation uses a cellulosic gum called Methylcellulose F50 which gels when hot, the opposite of virtually all other gelling agents. When simmered in the soup it has the same effect of forming a raft and drawing out impurities but does not leach out as much flavor as traditional methods. It's also much faster. Modern technique improving on a very traditional dish is a big win in my book. Prepare the soup base (up to 24h in advance): Parboil the pork in unsalted water for 5-7m. Strain and rinse well. Brown the pork in a pressure cooker with a bit of oil. Add all remaining ingredients except the water and saute for 3m. Add the water, bring to a boil, seal and cook at high pressure for 2h. Depressurize with cold water. Strain. Skim off the fat and reserve some in a small squeeze bottle; discard the rest. Chill the reserved fat. Prepare the clarified soup (up to 24h in advance): Measure 560g of the soup base and blend with the pork chop and Methylcellulose F50 until smooth. Transfer to a pot and simmer on low heat for 10m. Gently scrape the bottom of the pot to release any stuck protein. Simmer on low for an additional 10m. Strain through a fine-mesh strainer, then strain repeatedly through a strainer lined with a coffee filter or paper towels until the desired clarity is achieved. Chill over an ice bath. Vacuum pack and chill until needed. To serve: Heat the squeeze bottle with the fat in a water bath to melt the fat. Warm the consomme and adjust seasoning. Drizzle some of the rendered fat on top before serving.